This large village occupying a dramatic setting at the foot of the Eildon Hills, 3 miles (5 km) southeast of Galashiels, 37 miles (60 km) southeast of Edinburgh, in the old county of Roxburghshire. St. Aidan founded a monastery here in the 7th Century and was succeeded by St. Boswell and then St. Cuthbert, yet the monastery was probably empty by the 11th century. The present abbey (1136) was built by King David I who brought in monks from Rievaulx near York. It was frequently and severely damaged in cross-border raids in 1322 and destroyed in 1385; rebuilt in the 15th century it was again damaged in 1544 and 1545 and repaired in 1822 with assistance from Sir Walter Scott and the Duke of Buccleuch. A later Duke gave it to 'the nation' in 1918. Alexander II is buried here and it is alleged that the heart of Robert the Bruce lies buried beneath the abbey's high altar. Originally known as Fordel, Melrose produced linen until the late 18th century; it is now primarily a residential settlement. Notable buildings include Darnick Tower (1425) and the Commendator's House (15th century); there is also a Mercat Cross (1642) and the nearby Abbotsford House (1817-24) built by Sir Walter Scott to an elaborate design. English author Charles Dickens stayed in Melrose for two nights in 1841. 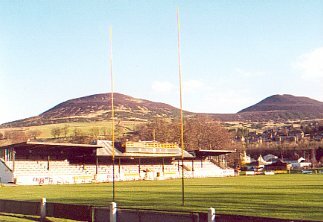 It is also known as the place where the game of Rugby Sevens originated and St Cuthbert's Way starts here. There is a Roman Heritage Centre in Melrose, while the remains of Trimontium Fort, an important military base for nearly 100 years, are nearby at Newstead. Priorwood Garden (National Trust for Scotland) includes an orchard and gardens with flowers suitable for drying. The Melrose Festival Week in June was instituted in 1938 to celebrate the town's history and includes the installation of a Melrosian as its central figure, together with the crowning of the Festival Queen and a Common Riding.